Topsy-Turvey Carbon Footprints from Nature Climate Change | Watts Up With That? The lastest issue of Nature Climate Change to reach my mailbox has some startling news, particularly considering that it comes from a generally Warmist publication. One might say is is “topsy-turvy” (upside down) from a Warmist viewpoint, but quite in keeping with a Skeptic point of view. 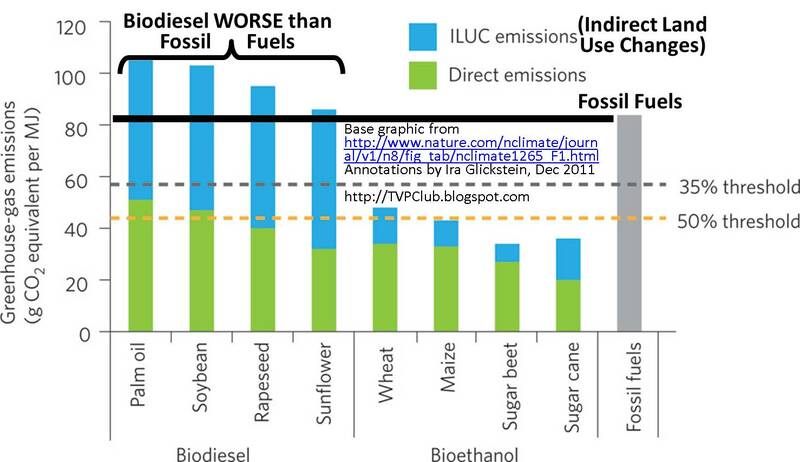 1) Total emissions from biodiesel are WORSE than emissions from fossil fuels, when considering both Direct and ILUC (Indirect Land Use Changes) Emissions. 2) Natural gas is WORSE than that “filthy fuel” coal when considering the net warming effects due to leakage rates of methane associated with natural gas and the cooling effects associated with aerosols from burning of coal. 3) Pure electric vehicles are WORSE than petroleum-burning hybrids, considering overall lifetime cost/benefits. 1) A BIOFUEL CONUNDRUM. Biofuels get their energy from the Sun and absorb CO2 from the Atmosphere, making them carbon-neutral. Right? WRONG. The graphic (from http://www.nature.com/nclimate/journal/v1/n8/fig_tab/nclimate1265_F1.html, annotations added by Ira) shows total emissions, which is the sum of Direct and ILUC (Indirect Land Use Changes) Emissions. Note that all sources of biodiesel produce more total emissions than the equivalent amount of energy derived from fossil fuels. Also note that bioethanol, while better than fossil fuels in this accounting, are far from carbon-neutral. The orange and grey dashed lines across the bars show the threshold for a 50% and 35% emission saving, respectively, compared with fossil fuels. Initially biofuels will have to deliver a 35% saving under EU law, but this will rise to 50% in 2017. Indeed, when policymakers talk about raising the threshold in the context of the ILUC debate, they are reportedly talking about raising it to 50% — this graphic shows that according to what we know about the scale of ILUC, this policy approach wouldn’t solve the problem. ILUC data is from a draft report of the International Food Policy Research Institute; direct emissions data is from the EU’s Renewable Energy Directive, © European Union, http://eur-lex.europa.eu. According to this research, bioethanol from wheat saves less than 50% of emissions as compared to fossil fuels. Other bioethanol sources are only about 50-60% carbon-neutral. 2. A NATURAL GAS CONUNDRUM. Natural gas (methane) produces only half the CO2 of coal per unit of energy, so it must be cleaner and greener. Right? WRONG. According to research by Tom Wigley of NCAR [Climate Change, 108, 601-608 2011]. It turns out that burning of coal releases aerosols that have a cooling effect. Of course, that is not news to those of us familiar with the 1974 National Science Board report that warned of Global Cooling due to human-caused aerosols. In addition, it seems that up to 10% of methane, a potent “greenhouse” gas, leaks out into the Atmosphere. Leakage rates need to be kept below 2% to beat fossil fuels. 3. AN ELECTRIC CAR CONUNDRUM. Pure electric vehicles, like the Nissan Leaf and my golf cart, release no direct emissions, so they are “greener” than hybrids or conventional cars that burn gasoline or diesel. Right? WRONG. According to research from Carnegie Mellon University [Proc. Natl. Acad. Sci., 108, 16554-16558 2011] hybrid and plug-in hybrid vehicles that burn some fossil fuels benefit society over their lifetimes more than either pure electric battery-powered vehicles or conventional gasoline-powered autos. Hybrids have smaller battery packs than pure electrics and therefore cost less to build and maintain. I guess Big Coal has finally paid up. I lived in Southeast Asia for many years and saw firsthand the vast areas of tropical forest that have been cut down to grow palm oil for biofuel. The worst ecological disaster of my lifetime. This information is unacceptably inconvenient. Next issue’s “Letters to the Editor” section should be interesting. There may be a problem with sugar beet as opposed to sugar cane. Sugar beet (as grown in Europe) needs around 5 times the land per tonne of sugar compared to sugar cane (as grown in Brazil). As land is scarcer in Europe than Brazil, even comparable crops require greater energy input. It might only be the physical factors that are considered here? On the other hand, I think the report seems to have missed a very important and obvious factor. Biofuels displace FOOD. If we proposed to burn food, the greeny grimies would be up in arms. Oh…maybe that’s where the military expense comes in? Anyway… the bottom line is, that is exactly what biofuels are… food raised to be burned instead of eaten. If we were to factor in the increased cost of food due to burning it for fuel as part of the “carbon footprint” of foodfuel (biofuel! what a dopey term) it would be even higher…much, much higher. We can’t save the starving masses by burning the food. Convert it into foodfuel first and then burn it, it is still the same as burning the food. In fact maybe foodfuel isn’t right either. How about foolfuel? It’s sad to see the Greens, who once supported Natural Gas, go against it as soon as we find that we have plenty of it. Wigley’s imaginary particulate cooling is particularly sad. It is only a fudge factor to make the GCMs agree and has close to no actual evidential basis. It’s a convenient stick to beat Natural Gas with though. Likewise the high leak rate will turn out to be mostly bogus. Those oil companies don’t drill extremely expensive wells so that they can lose all their product to leaks. Natural gas has one flaw. It is cheap and abundant. Sounds like they ruled out nuclear power as an option from the outset. Electric vehicles and hydrogen powered vehicles only make sense as a carbon reduction strategy if the electricity they consume was generated without burning fossil fuels. Otherwise you are just powering vehicles with fossil fuels in a less efficient and more complicated manner than simply burning the fuels in an internal combustion engine to power the vehicle directly. There is a lot of variability (as you would expect) in individual processes/plants/locations. For example, ‘no till’ agriculture has been promoted for a while now in the US, while Europe is mandating sustainability criteria meaning that land-use changes are out (essentially this means that you can’t new-plough land to plant energy crops, and planting trees on arable land or grassland is out too). For many crops the issue is distance from field to fuel processing; overall it is how much fossil fuel is used in a) growing and harvesting the crops, b) taking it from the field to the processing facilty and c) processing it in the facility, and that’s often a lot. There’s a lot of effort going into developing more energy efficient processes, in using byproducts to produce energy to run fuel processing operations, but, yep, the shine has definately gone off biofuels. If indeed Wigley wants to blame aerosols for cooling, then the LACK of aerosols from all the regulations that have improved our air quality over the last few decades would be what’s responsible for what little warming we can measure at all…not CO2. At day’s end…the aerosols will prove to be just as miniscule as CO2, but if Wigley wants to count ’em, well then, let’s count ’em. How to you extrapolate aerosol levels from the number of arrows you can stick in the smog? I love the smell of diesel exhaust in the morning. There is something just wrong about a diesel truck going down the road smelling like stale (insert your favorite fast food retailer here) french fries. It’s about time someone published a lifetime cost analysis for these all electric vehicles. To have that included with a look at CO2 issues with biofuels is a bonus. I think the AGW argument is finally beginning to consume itself, even among the “true believers”. (hybrid???) and the like, as examples of how to reduce energy consumption. Nothing wrong with that in my opinion. There is something “just wrong” about consuming something just because you can. To be judicious in our consumption – of any resource – is good because it reduces our direct costs for the item (usually energy related) and also often times lets us all tread more lightly in using the earth’s resources which like it or not are finite. As a child I was told to use the right tool for the right job. This applies here I think. By seeking the right solution to our pollution issues (and we do have them folks!) we make this a better place to live. By falling headlong down the rabbit hole with these AGW claims, we waste resouces, money and time that could be better spent helping others to live well. That’s my story and I’m sticking to it!!! How exactly did they differentiate the military expense of defending our oil supply from other military expenses, like providing a defense umbrella for our NATO and EU allies who’ve been underfunding their own defense for decades to keep their socialist dependencies afloat. I know the left’s fallback position is that all our “wars” have been “Blood for Oil” but from what I’ve observed the only oil we end up with has to be purchased on the open market just as it would have been without any military action. Often we end up subsidizing the renovation of oil production facilities and still don’t get a hint of a discount. Since most of our wind generation has been shipped in from China, the cost of protecting the world’s shipping lanes could just as accurately be described as protecting our access to wind turbines. Not wishing to be arrogant or supercilious/facetious – but to anyone with a modicum of common sense, these figures are well known/demonstrable and easily deduced from basic knowledge of the facts. The way I see it is simple – take a car, any make, doesn’t matter which one – and then try and argue that that car is better than ‘another’ one…..it isn’t, it’s a case of horses for courses and if the flippin chevvy volt (or whatever) was the most cost effective and best car out there – we would all have one! Why should ‘fuel’ be any different? There are (few) places where solar is viable, and hydro, and wind, bio, etc – but NONE of them is permanent generation and even if you worked it out on a cost per square metre/kilometre/mile basis, or whatever – they would NEVER provide the required power demand for the current population without some other ‘loss’ (e.g. land for food production). I don’t care which side of the fence you sit in the AGW debate, the fact remains that the worlds population NEEDS power (I’d like to know if anyone can sensibly argue against this basic point?) – and right now, the only sure fire guaranfeckingteed future RELIABLE power source is NUCLEAR or Fossil fuels, but of course the latter is ‘limited’ to some degree. Sure, we can use low energy bulbs and become more fuel/power efficient – but we still need power and will continue to do so. Whether the world gets a ‘temperature’ or cools to an ice age – it makes no friggin difference – power is what is needed to mitigate that change and keep millions of people fed and watered. As far as I can see, in the longer term – that power demand needs to be met by nuclear and the billions spent on bio/wind/solar,etc would be far far better spent developing safer, cleaner and more efficient nuclear power – fusion even?. Just think of the advances a few tens of billions of dollars could have had in the nuclear field over the last decade or so, instead of being used to line the pockets of Jones, Mann, Hansen, et al!!!! Mike Bentley wrote: “As a child I was told to use the right tool for the right job. This applies here I think. By seeking the right solution to our pollution issues (and we do have them folks!) we make this a better place to live. By falling headlong down the rabbit hole with these AGW claims, we waste resouces, money and time that could be better spent helping others to live well. Looks like they’ve discovered that things are never quite as simple as they look at first blush. An answer to the question of what price to put on carbon dioxide. It’s not from those phony carbon markets. It seems that enhanced oil recovery (EOR) needs the gas to pump into old oil fields to extract oil. They’ve been doing this for years, using naturally occurring gas. But they’re running out of the easily obtained gas. Now all they need are pipelines to receive recovered carbon dioxide from coal-burning plants and then we’ll see what price for the gas in a real market. I thought everyone already knew all this ? Maybe not the lunatic fringe, but anyone capable of absorbing information or thinking logically. One of the most insidious lies told by the nutters was that pouring food down our fuel tanks was a good idea. It was wrong on so many levels, and it remains so. It drove up the cost of food over the entire world. It limited the supply and cut down on the diversity of crops planted. Of course, there are other issues well known, ……. efficiency….. fuel, energy and other resources used for growing the crops……. I have been in the solar business since 1978 and since 1982 most of my clients have been in the oil and gas business. I was a TV news reporter from 1970-75 and during that time filmed a UPI award winning documentary on coal. I am one of the few people on earth to have crawled to the start of the Browns Ferry Nuclear Power Plant fire. I understand biofuels to some extent and weather is my hobby. I listened to Al Gore Jr. talk about carbon before he even ran for any office and I know about the coal and nuclear empire his father and FDR helped create. It bothers me that in all the passionate blogging on these pages, reasonableness to me seems to have been mostly abandoned. The least expensive electricity in the US would be from low head hydro which is nearly illegal. As regards the hazards of other forms of energy, in my opinion, safer nuclear plants can be built but they are regarded as too expensive. Cleaner coal burning plants can be built but they are regarded as too expensive. So the least cost option de jour for now appears to be frac gas. Regardless, a society that cares about the cost of pollution in terms of health, birth defects and premature death, would be interested in decreasing that pollution with genuine conservation through appropriate architecture, plug in hybrid vehicles which an article above gives better status that straight electric or combustible fuel and, in my opinion, a marriage of solar electricity and plug in vehicles. Without any government subsidy, in most of the US, charging a vehicle with solar electricity is the cost equivalent of $2.50/gallon motor fuel. Solar is grossly underutilized world wide. Also grossly underutilized is biodiesel made from the millions of gallons of used fry grease from fast food restaurants and oil that can be skimmed from massive, urban sewage systems. Fuel crops are dubious options but used fry grease…why not???? More freight on trains…why not??? More efficient architecture, windows, insulation and motor efficiency…why not??? More efficient lighting…why not??? Solar water heating for process hot water in sunny places like Las Vegas for dishwashing, laundry, showers and baths…why not??? They wash a lot of hotel towels and sheets in Vegas! They was a lot of dishes in Vegas! Nuclear is the needed source for electrical power production. This should be the focus on energy policy. Large scale solar and wind seems to have been proven to be a bad joke. 40 years ago I was at a mansion where the owner added some coal to the two fires burning in 2 of the 6 fireplaces. It was a marvelous fire of intense heat. I presume that sort of coal burning can never be allowed again? The biodiesel figures are for contemporary strains; those costs will decline as newer strains are bred for higher oil yield and more extreme climates and soils. Already salt-tolerant soybeans exist, and salt-tolerant strains of other plants are under development. In the US, much if not all of the maize for ethanol came from the half of the maize crop that was used for cattle feed; the amino-acid rich leftovers were made into cattle feed. That was not true everywhere. What the future holds can only be guessed, but there are many places on Earth where biodiesel from salt-tolerant feedstocks would be an improvement over what they have now. Like the Green Revolution and the Brazilian cane ethanol industry, it will require 2-3 decades of continuous crop breeding. Mark says: Fuel crops are dubious options but used fry grease…why not???? This is a small but growing industry in the U.S. An example is Greenleaf Biodiesel in San Diego. Hobbyists do it in every state, and you can order varieties of the refining equipment online. It can’t be a large contribution to the US fuel supply, but every bit helps, and in some niches it fits well. Fuel is also being made more frequently from animal waste from factory farms and packing plants, and from feedlot waste; also, from municipal solid and liquid waste. But the real future, I think,, will come from breeding better varieties. Stop agriculture now, before we all die. Oh wait…. Oops. Greenleaf Biofuels is in New England. The company in San Diego is called New Leaf Biofuels. We currently enjoy the longest life expectancy in human history. Survival rate from birth to adulthood is the highest in human history. We are the healthiest we have ever been in history, as evidenced by the current population being taller and stronger than at any time in history. Our forefathers of just three or four generations ago were midgets by comparison. 6 feet tall was a huge man 100 years ago, today a 6 foot man is commonplace. Take a tour of a war museum and look at the World War 1 helmets, the average 14 year old wouldn’t fit into them today. I’m not saying there is no such thing as pollution. But this notion that it is significantly altering the health of the human race as a whole is nonsense. Are there negative effects? Of course there are. But the fact of the matter is that the combined effects of industrialization, the good ones and the bad ones, are massively positive. Premature deaths? Gimme a break. If premature deaths were an actual real problem, we wouldn’t have the longest life expectancy in history by several decades. I thought everybody knew all this, too. But reading some of the above comments it seems we were both wrong. It seems that (as is usual in all things) it is a mistake to assume everybody knows the bleeding obvious. As to “right solution”, I have one word: Thorium. But I do take umbrage at the term “our pollution issues.” If you aren’t old enough to remember the pre-1970s atmosphere in our cities, you don’t know what pollution is. Every factory with industrial exhausts (those that still haven’t moved to China) has a scrubber, to burn the VOCs (volatile organic compounds – mainly sulfer oxides, nitrogen oxides, and carbon oxides). Our skies (at least in the US and Europe) are so much cleaner than before. The air deep inside Chicago now is as clean as rural air was 40 years ago. How freaking clean does the air have to be? Before mid-1970s: Temperature inversions, killer fogs in London, coal dust in your nostrils, horizons that couldn’t be seen, leaded gasoline cars spewing exhaust none of us have seen for 35 years, and lots of respiratory ailments. And cities no vacationer would visit. After 1980: Cities started becoming vacation destinations, traffic jams with nary a hindrance to horizon visibility or breatheability, clean nostrils, no lead in car exhausts, and when was the last time London had a fog that endangered life? Now, in the US we even make BAKERS, of all businesses, have “oxidizers” (formerly known as “incinerators”) on their roofs, because even bread ovens’ exhaust is considered pollution. Fresh baked bread is a pollutant? Oy VEY! People today use the term “pollution” without having ANY idea what it was like – or they choose to pretend that today’s clean air is actually pollution. Such claims are laughable. And ignorant. Mike, do you really want to be repeating such warmist dogma? To answer your ‘why nots’, I can understand the point that you make but I think it is done much more that maybe you realize. Used fry grease is in hot demand and often ‘stolen’ before the suppliers of the collection bins can collect it. Freight moves on trains now. Insulation, windows; check out any building code. Motor efficiency, some needs require more than others; mountains, loads, towing, etc. Hydro electric, point that one at the very ones crying against nuclear and fossil fuels. How large of a solar water heater collector would be needed for that Vegas hotel? If it is feasable I’m sure someone will be doing it. I doubt that you will find any viewers at WUWT that feels a need to waste energy. That is why there is a lot of dissent with regards to the government regulated policies (mandates) directing so much energy in both effort and source to failing policies. You can or should be able to purchase any vehicle that meets your needs. No one should force me to allow another to dictate a vehicle that I must adapt to. I don’t eat french fries so I do not contribute to any perceived grease problem. Please feel free to order yourself a large order of fries if you wish. One closing thought on efficiency, why would anyone support the conversation of food sources into ethanol? I takes more energy to produce it than it supplies. It will not produce enough energy to use a portion of that to produce itself. The EROI is negative. Put it in you car and the MPG in every case that I know of will drop 20-35%. It is another of the failed policies of the green agenda. Wind; Go back 150 years and wind was a major source of power. Shipping was wind powered, water was pumped by wind mills, wind did all sorts of work. We got rid of it in favour of fossil fuels. Why? Because it was erratic and inneficient then, and it still is. Wind power is obsolete. Biofuels; There used to be a profession called a “wood cutter”. That was a guy who would go out and cut wood and bring it back so people could burn it to keep their houses warm and cook food. We got rid of biofuels. Why? Because as communties grew, the wood cutter had to travel farther and farther to gather enough wood, until one day, he met the wood cutter from the next town half way and had a fight over the one tree left between them. In the meantime, the land cleared by the wood cutter wasn’t being used anymore to grow more wood, it was being used to grow FOOD. If, in medieval times, one were to propose burning the food, you’d wind up swinging from a tree. Given the choice between food and fuel, food comes first. Biofuel is obsolete. Solar; Don’t make me laugh. We built houses with fire places and later furnaces for two reasons. The first was half the planet isn’t warm enough to live in just from solar, and the other is that solar is intermittant and erratic. Not to mention that goal, I thought, of cutting back on carbon emissions was to reduce the amount of heat trapped on the planet, so instead let’s build solar cells that…trap the heat on the planet. Solar is obsolete. Nuclear; This actually works. Oddly, the very people who don’t want fossil fuels, and advocate for obsolete technologies like biofuel, solar, and wind power, are also first in line to block nuclear as an alternate energy source. Nuclear is not obsolete, but the greeny grimey grinches don’t want us to use it. Hmmm. They want obsolete options, but not new options. Hydro; This works too. Try and build a major damn however, and out of the woodwork come the same greeny grimey grinches that wouldn’t let us build nuclear power plants. They just turn their protest signs backwards and paint new slogans on the other side. They scream bloody murder about the harm to the environment. Oddly, when a beaver builds a dam, itz natural. When a human builds a dam, itz an ecological disaster. Odder still, many of them go every weekend to their cabin that the lake to enjoy nature…forgetting that the lake they are going to frequently exists because someone built a dam, and they can sleep well at night not worrying about bears breaking in and eating the children because someone built a less than natural cabin. They want obsolete options, but not practical options. To make matters worse, they want to transfer money to the 3rd world. I used to give money to help fight starvation in Africa. The tyrants that ruled those countries siphoned off the funds, and I saved no one. Then they demanded (not asked, demanded!) money for educations and infrastructure. Through my taxes, I got to contribute to that too. The tyrants that ruled those countries siphoned off the funds, and I educated no one. Now they are beyond demanding, they are extorting money from me, and what will happen to it? It will be well spent to make a better world for all of us to live in. Yeah, right. If you’ll buy that, then I got some tundra in northern Canada that’s going to be worth a fortune soon because is it the last place that humans will be able to survive global warming. How many hectares can I interest you in? Forests and jungles are all very nice and all that, but you may be forgetting the world population is predicted to peak out at double today’s population in about 2050. All that fuss about Brazil cutting down forests, and now they are one of the biggest soyabean, corn, beef and sugar cane producers in the world. There is a similar story for SE Asia and palm oil. And you can go out and grow rain-forest if you like. In 50 years you would not recognize that it had been gone (yeah, I know it’s not the same, biodiversity etc etc, but I have great confidence in our ability to preserve and restructure without locking up vas areas). I believe most of that talk is related to economic hegemony strategies anyway, tying up third world agricultural land and countless mineral deposits. there are many places on Earth where biodiesel from salt-tolerant feedstocks would be an improvement over what they have now. Like the Green Revolution and the Brazilian cane ethanol industry, it will require 2-3 decades of continuous crop breeding. The problem is that much of the feedstocks will be grown on currently natural environments. Palm oil in SE Asia, Sugar Cane and soya beans in Brazil. Eucalyptus trees and whatever in Africa. Perhaps 40% of the remaining forests in SE Asia have been destroyed to grow palm oil for biofuels. The Warmists and Greens are are commiting environmental vandalism on a planetary scale, and forcing the rest of us to pay for it. There is a spurious ‘methane leakage’ number floating around, and this sounds like it. As I recall, someone looked at how much gas is delivered, vs. how much comes from the well. They assumed that the missing fraction simply leaked away. Besides being salable, the other thing about methane it is highly flammable. So, if they can’t ship it, they have to flare it off, not leak it. Also, I think some fraction of the gas is burned to operate the compressors that move the gas from wellhead to market. The leakage numbers aren’t making any sense. Clearly the goal of the authors was to paint natural gas as a bad actor. Interestingly enough, maybe we should be dumping sugar into our cars instead of into our bellies. We’d have a dual benefit: we’d lose weight, and the biofuel would be friendlier. And, as we lost weight, our cars would go longer distances courtesy of lugging less of our wide loads. Ira, it seems that you have not read my post about methane (click on my name and also look at the replies where there is additional information about a comment from Willis E). Methane on its own (from leakage etc) is a insignificant greenhouse gas -have a look at the absorption spectrum. Methane produces greenhouse gases when it is burnt -water vapor being the important one. The total equivalent as CO2 greenhouse gases when natural gas is burnt exceeds that of coal. As I state -burning of natural gas is not more friendly than burning coal and leakage of methane (from pipelines, coal mines, swamps or ruminant animals to the atmosphere has no significant affect on the atmosphere. The IPCC alarmist figure of methane being 21 times CO2 (copied by the US EPA) is a gross manipulation of data to discredit the use of coal. It is a figure oil companies approve to sell LNG and CSG and minimise the threat of coal companies. BP (Australia, Indonesia), Shell (South Africa, Australia), ESSO (Venezula), Mobil, Total and some other oil companies at one time owned coal mines but made a financial mess of it through poor management. The oil companies particularly BP and Shell have been financing green groups to further their agenda to dominate energy supplies. As an engineer I consider that a combine cycled power plant using gas turbines and waste heat for a steam turbine (or for hot water eg in hospitals) is an efficient use of energy. However, Efficiency needs to take into account the total cost. There needs to be open competition with the supply of all methods of power production and energy conversion. The world is not better off if an energy source eg coal or nuclear energy from thorium, uranium, deuterium etc is restricted for pointless political reasons. What’s amazing is the length of that url link. I keep forgetting that its uncommon sense not common sense. The old is new again ,antique energy systems R us? Is this the beginning of the Glibbering Climb Down by our Climate Authorities? Mark – as to your ‘why nots’. I’m sure that most people will agree that a more efficient car, a better insulated house and a cleaner power source are all good things that should be pursued. But here’s the rub : every choice has other choices that must be foregone to offset them. We individually live in fixed-pie worlds. Most people cannot freely expand their incomes at will. This is true at the micro-level, it is true at the government macro-level. So while it’s a noble thing to want everyone to have more efficient houses and cars, the simple truth is that it’s simply not possible to just make this happen with the sweep of a pen. Every time you force a family to install insulation, the money that might have been spent on something else is diverted towards something that probably has a lower value to them. For the majority of the planet, and even the majority of most industrliased countries, it’s not a choice of foie gras or insulation, it’s a choice of insulation or some other basic need, like perhaps healthcare. Given enough time and development, energy efficient vehicles and homes will filter down to the point that everyone has one. This is the natural way of the market, of development. The average suburban house is full of luxuries a Medieval king would have slaughtered a population to get, not the least the pill bottle full of penicillin and the blister pack of aspirin, and dare I say the bottle of little blue pills in the bedside table. You only need to go back 150 years and not even the president of the USA had an air-conditioned office. If you try and force improvements on people by dictate, you do two things : 1) you entrench inferior technologies because of the lack of need to improve and 2) you impoverish people by forcing them to buy technologies that have not yet fallen into their natural ability to buy. So to summarise, nobody is saying ‘no’ to hydro-electric power (except for the Green parties). Nobody is really saying ‘no’ to electric cars – if you want to buy one, more power to you. What people are saying ‘no’ to is tax money being wasted on windmills, massive subsidies on solar power and massive subsidies on electric cars. Taking the collective wealth of a country and wasting it on inefficient technology is as stupid as wasting the money on ridiculous military adventures that achieve nothing. So the reason ‘why not’ is that there is no need to force good technology on people. They will adopt it when it makes sense for them to do so. Trying to interrupt this basic pattern results in imbalances in the technology development, and prevents other technological improvements due to lack of capital and lack of market. It’s otherwise known as ‘central planning’ and ‘picking winners by politician’ – both of which are rightly known as a Giant Waste of Time and Money. Nothing counts since CO2 is not a pollutant, but a plant nutrient. The terms “carbon footprint” and “carbon neutral” do not make sense if you take into account that CO2 is a plant nutrient. You are assuming that biofuels are just as efficient as fossil fuels. As a rule of thumb, they are not. Further, one has to ask what the productivity on the land would be if it were not being used to grow food-for-fuel. Yes, food is one option. Trees are another. And a tree would be… a carbon sink. Now if food, when eaten, does it get completely recycled like food-for-fuel? No, we humans ain’t that efficient, nor are our livestock. So…food is also a carbon sink. You can’t make a blanket statement about something being neutral or otherwise without considering waht the “direct” results of NOT doing it are. Phillip Bradley: Perhaps 40% of the remaining forests in SE Asia have been destroyed to grow palm oil for biofuels. My reading was that most of the forests lost for palm oil had already been lost to logging. However, clearing undisturbed land for new palm plantations is occurring. Mark says … Also grossly underutilized is biodiesel made from the millions of gallons of used fry grease from fast food restaurants and oil that can be skimmed from massive, urban sewage systems. This is a gimmick at best. Yes it works but try scaling it up to run an entire transport industry. Even Americans don’t eat that many french fries. eyesonu: Large scale solar and wind seems to have been proven to be a bad joke. Solar even provides part of the power for two new PV fabrication facilities in the U.S., one in Arizona, one in Michigan. Where sunshine is plentiful and coal and gas are not, solar is a good source of electricity. I personally would like to see more construction of nuclear power plants, but I think that the the golden age of PV power is upon us. Only the sources are old-fashioned: the harvesting technologies are new. Growing industries everywhere are bidding up the price of coal, oil, and natural gas. The U.S. has plenty, but even for us, PV power is commercially viable in some places. Because you can’t do just one thing. Quite correct, but I was putting it in the context of the paper (and trying to be brief). I don’t think I am assuming anything about fossil fuels. All I’m saying is that all the direct CO2 from biofuels is recycled C, so is not a net emission (unless the original absorption by the biofuel crop is being counted separately). NB. This does not mean that biofuels are carbon neutral, because there are indirect CO2 emissions too. Yes one does, but surely it’s best to assess the effect of each other possible use and put it alongside biofuel for comparison. Maybe it would be legitimate to subtract the effect of doing nothing with the land, but for nearly all land that effect is close to zero in the long term – even the greenies’ favourite forests are carbon neutral because the total amount of C in a mature forest doesn’t change much. There are exceptions, such as forests in swamps (eg.) that are creating future coalfields, but these are rare I think. There are also other factors, such as biomass increasing as atmospheric CO2 increases, but the figures I have seen indicate that the effect is very minor on a per annum basis. Septic Matthew – Algae farms are another form of solar power (I think the first one(s) are now in production??). Thank you, Dr. Glickstein. Massive FAIL. We were working on mitigating natural gas leaks at the Gas Technology Institute, it is a daunting problem. With all the new hyrofracking production underway, I’m sure methane is venting from all over creation. I read here a while back that in the winter, especially in the north, it sludges up worse than than normal diesel. you lost me the moment you mentioned being associated with Al Gore. That being said, this non-scientist still has some comments to make. 1. Pollution up until the end of the 1980s was definitely a problem. I live in Australia and was raised in Melbourne. I did suffer from the effects of pollution, in particular goint anywhere near an oil refinery produced a very severe headache. However, with the improvement in the quality of the air as a result of changes to car engines, the pollution in Sydney in particular has cleared. The same is true for New York City – I was there in 1985 and returned in 2009 and there was a very visible difference. What I find is that this nonsense about CO2 as a pollutant is diverting attention away from where the air needs to be cleaned up, and that means that a lot of the good that has been done will end up being undone, unless we cut the crap!! 2. Biofuels, especially ethanol – Here in Australia we have had fuels that have been part bio-fuels. For earlier cars these fuels were a disaster, and their use actually reduced the life of the engine and did damage to things like the Fuel injection systems. How do I know? I used those “cheaper” fuels and ended up wearing the costs in fixing up my car!! This was improved when cars were built using the catalyctic converter. On the same issue, I found that the ethanol fuels did not go as far a distance as the ordinary fuels I drive a six cylinder Ford and it is fuel efficient on the open road. I have seen the comparison and the distance covered when travelling a great distance is definitely reduced if I used the E10 fuel. 3. Insulation makes little difference in a lot of houses. The best time to introduce insulation is when the house is being built. It is far better to design a house that is efficient and “sustainable” than to alter an existing house. 4. Natural gas is far more efficient than using electricity for cooking. 5. Hydro-electric power is a clear winner but the watermelons will not let us build the dams to create hydroelectric power. 6. Coal power is still very efficient and cheap as a source of electricity, but nuclear is cleaner. I have always wondered where on Earth these pure electric vehicles get their power for their batteries from. Solar? Wind? Coal, oil, gas maybe? Mike Jonas: Septic Matthew – Algae farms are another form of solar power (I think the first one(s) are now in production??). Agreed, and the focus of selective breeding experiments, which have produce increased yields. What about those useless desalination plants that we now have that consume enormous amounts of electricity at huge cost … that’s Green sustainability for you. Instead of electric cars we must have no cars. Instead of cheap and clean gas for fuel, we must have no fuel. This report, it seems to me, is not in favour of the status-quo, nor the “clean” alternatives. It fits neatly into the greeny slot though: Austerity, poverty and misery. This helps whose cause ? Ever think of writing a book on the known history of our climate ? you have the write attitude to make it a great success. Algae farms are solar power? Oddly, I would have thought they were bio-fuel-food. By that definition, wind power is actually solar power too. The plants are useless because they’re in the wrong place. There are lots of regions/locales where they’d be worthwhile. Just ask the Israelis, who are experts at building and locating them properly. It seems the Carnegie Mellon University didn’t calculate the electricity needed to refine gasoline. The amount of electricity needed to produce 1 US gallon of gasoline can power an electric car about 25 miles, according to Nissan. Sorry no link. Of course no link. That’s like the claim that there’s a secret carburetor that runs on water. No mention here (that I noticed) of the congress mandated “10% added ethanol” foodfuel in gasoline as a payoff to ADM and the USDA. Nor of the 6 – 8% mileage decrease resulting from the use of that adulterated fuel. How much electricity is used to refine a qallon of gasoline? Granted, external costs are overlooked by a free-market model, but much of the debate over the various fuels would be settled by just letting the markets work. If land has a better market use for something other than sugar beets, then that better use will occur naturally over time. If battery powered vehicles are less efficient, that will also be reflected in the pricing, and they will go out of favor due to cost. Etc., across the board. Well then we’ll just have to levy big carbon taxes on big-agribusiness as well. This is great news! More money for the government. Whoo-hoo! What is even more fun is looking at the conversion ratio of sunlight (insolation) per sq.m. per month in KWh over any given growing area (it varies by latitude but a rough and ready is 4KWh/sq.m./month) and then at the conversion ratio to actual, useful fuel in terms of energy harvested. For its growing season (approx. 125 days) corn gives a 9% return in the way of energy in ethanol, unfortunately you get nothing for the other part of the year from that land. Cane sugar doesn’t do so well at a 5% return, but has a continual harvest cycle in the tropics. Ethanol itself contains about half the energy per volume as gasoline does when oxidized. Biodiesel fares a bit better as diesel from plant oil is as energetic as petro-diesel. Palm oil is harvested at about 635 gal./acre, Jatropha 202 gal/acre, rapeseed about 127 gal. acre. So all you have to do is take the number of gallons of diesel consumed per country per year, divide by the number of gallons each plant type yields and you get the number of acres needed to replace the diesel fuel with plant based derivatives. And thus use up all the arable land on most of the planet, as these crops don’t tend to grow well in the sea, in mountainous terrain, in deserts, wetlands (swamps, bogs, marshland), and on concrete. This is without any cost in the way of energy for planting, harvesting, using insecticides, processing, shipping, etc. of the fuels involved. And a few of those plant types need large amounts of fertilizer or they deplete the soil of nutrients very quickly, thus putting an additional part to the processing train into the mix. None of these plants reach past 10% conversion ratio per sq. m. of energy to something useful, while even thin film amorphous silicon starts there at a 10% conversion ratio to electricity. Better ratios have come through more refined substrates but those cost more to process, etc. Even if you add in the waste part of the plant (cellulose material) to get its energy, I can’t see where the return on energy gets to, say, 35% per sq.m. Plus that stuff takes more processing, sorting, etc. and has its own energy use and production train to it. Algae sounds good for industrial plants, and is a nice energy recapture system, but only that: it takes waste heat from industrial plants and produces gasoline. Even if you put one on every, single energy wasting business, industrial site, etc. you are looking at a brand-new heavy industry to make the stuff and then faced with 70,000 gal/yr. gasoline and dividing that into what a nation uses per year to see just what sort of numbers you need for a nation. This is a ‘better’ solution in that it doesn’t use arable land, but it is in no way an ‘answer’ just a way to recapture waste energy. 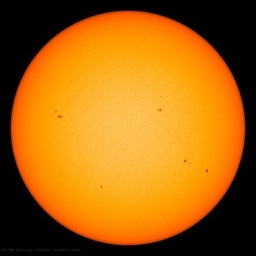 Those directly driven by sunlight have their own sq. m. to fuel ratios, but can be put on land not typically used for agriculture. Ralph, that’s comparing apples and artichokes. A portion of the energy is used in refining. But all the fossil fuel used to produce electricity goes into making electricity, not just a portion. And that’s after refining. Further, there is already arbitrage happening between electric rates and other power sources. If everyone drove EV’s, electric rates would skyrocket because you can’t get something for nothing. Right now EV drivers riding on the backs of the average electricity ratepayer. Finally, I would never trade my gasoline powered car in for an EV. I get “only” 30 mpg, but there is no Leaf, Volt or Prius that can keep up with me in either acceleration or speed. And I get well over 300 miles to a tank of gas, and I can “recharge” in only a couple of minutes. It’s a no-brainer, especially since electricity rates will necessarily skyrocket. But don’t worry, there’s an alternative. Tom Wigley left out a huge componant of this equation. Coal mining is by far the number one man made source for methane venting into the atmosphere. five years ago I was at a conference and a representative from the Chinese department of mining admitted at that time they vented over 345 billion cubic feet of methane into the atmosphere every year. I know of several coal mines in the western US that vent 6 to 7 million cubic feet of methane into the atmosphere every day. Natural Gas drillers would never be allowed to vent even a fraction of that volume of gas. Mike, how does one go about BUYING fuel? With money. Earned how? By working. Is work carbon neutral? NO! Unless ALL the fuel sources you use are net neutral (and they are not) then work is be definition carbon positive. Since you have to work more to buy the same amount of end result from the fuel you buy, an inneficient fuel is hugely carbon positive. Always. Even if all you do is sit at a desk and shuffle paper, the outcome of your work in the economic foodchain is physical work at some point, done by fuel sources that are net positive. Fooffuel is foolfuel. 3. Whatever mother nature decides to grow. 1 and 3 are carbon sinks. 2 is carbon positive as I’ve explained above. If you are picking by carbon impact, and can only pick one, FoodFuel is last on the list. If you are picking by net benefit to humanity, FoodFuel is last on the list. Assessment of possible uses complete. Smokey, I wouldn’t trade my Nissan 370Z for a Leaf for any reason. EVER! I simply commented on the common pratice of some people saying EV’s create more pollution than ICE automobiles. FINALLY, an attempt at looking through the wide-angle lens. However, I sure would not put any stock in that 1974 report, concerning aerosols. We have come a LONG, LONG way in reducing pollution from coal-fired power plants (as well as all other types of industrial facilities), since 1974! Also, why is corn ethanol not mentioned? I agree, Mike Jonas. In the graphic at the head of this posting, the “Direct Emissions” (in Green) should only count those direct emissions required for growing the crop and processing and distributing the biofuel, and should surely not include the CO2 emitted when the fuel is burned because, as you say, that is recycled carbon. But, then they note that the growing trees, cleared to make way for biofuel crops, would have continued to absorb CO2 had they not been cut down. On the other hand, they note, as some point mature trees absorb less CO2,and, of course, the biofuel crops absorb CO2. After reading all that back and forth I am unsure what the Green part of the bar graph represents. Always great to hear from you Dave! First of all, the quoted words are not mine, but were copied from the Nature Climate Change item that summarized the Carnegie Mellon research. Secondly, IMHO they are correct. Indeed the blood and treasure we expend protecting our access to relatively inexpensive oil from politically unstable regions is the main reason I favor a Revenue-Neutral Carbon Tax collected at the mine, well, and port and distributed on an equal per-capita basis to all citizens as a free market-based way to encourage development of more efficient and mature domestic carbon-free and carbon-neutral energy sources. Every war is about something, and control of energy lifelines is high on the list at any time. Or have you accepted the meme that “Oil” is a universal smear-word? Note about algae ponds, etc: the cost of “fertilizer”, aka algae food, is very significant, and frequently a deal-breaker. TANSTAAFL, even for algae. I’ve no clue what the “real” reason for invading Iraq was, but here’s the facts. 1. The bulk of oil contracts in Iraq have been awarded to Russian and European companies. 2. The bulk of Iraq’s oil exports go to Europe and other nations, not the US. So….if the US spent blood and treasure for the purpose of securing oil supplies, may I gently suggests that you got screwed? The profit from developing Iraq’s oil and the security of supply seem to be benefiting a lot of countries, but the US is not one of them. Smokey: I get “only” 30 mpg, but there is no Leaf, Volt or Prius that can keep up with me in either acceleration or speed. Are you sure? My son’s Prius, that I have been driving for a while lately, has very good acceleration and can easily maintain a highway speed of 90 mph. At that speed, fuel economy suffers, but at a highway speed of 70 mph it gets 45 mph. … Also, why is corn ethanol not mentioned? jae, please have a look at the sixth bar from the left on the graphic at the head of this posting. See the “Maize”? That is what they call corn. OK? Your post at December 12, 2011 at 8:31 am is similar to a simplistic explanation I use to aid the understanding of those who think all forms of ‘alternative’ energy and recycling are good. money is payment for work done. So, by definition, if it costs more then it uses more en energy. First I like to call ethanol Cornanol, Maizeanol is also good. Maybe I just missed it but I cannot find that the post took into account the fossil fuel used to plant, tend, harvest, dry and ship bio sources, corn etc. I thought the propulsion power of petroleum fuel used was equal to the Cornanol produced, if the maize isn’t shipped too far. Now for the emissions. I keep rereading the chart and only see emissions for bio-fuel and land use change. In the case of Cornanol the fossil fuel emissions should be added to the bio-fuel emissions. I have no clue about the other bio-fuels. OK, Doktor, I thought maize was a stunted relative of the towering Iowa variety, but I stand corrected by you and Wiki. BTW, what’s with the “OK?” I was not trying to be a wise guy. Well Phooey. I skimmed the comments again (yes I really did read them before writing) and found that my comment had already been covered. So I shall change my idea to subtract the emissions of Maizeanol (maize in deference to the international readers) from the fossil fuels emissions and add the difference to the Maizeanol emissions. As for the Iraqi oil, it doesn’t really matter who drills and sells it, from the POV of a consumer nation, as long as it hits the open (fungible) market — and as long as it’s not in the hands of someone (Saddam, e.g.) determined to cause chaos and disruption with the process and proceeds. Even the Russians aren’t such loose cannons, though cannons they are. Jackstraw, look at this http://cementafriend.wordpress.com/. Ira did you read my comment. Methane is a negligible greenhouse, both in radiation absorption and quantity in the atmosphere. The Oil companies have “snowed” the greenies. Further, so-called climate scientists have little understanding of heat and mass transfer (they disregard heat transfer by convection and phase change) or utilisation of energy. With regards to several comments regarding the efficiency of ethanol producing less energy / power as compared to gasoline when used in an automobile one serious factor that needs to be considered is the function of the fuel and ignition systems on engines not specifically designed for ethanol as most cars over 5 years old. The knock sensor, engine exhaust sensors, electronic engine control (computer), etc work together to control timing advance and fuel/air mixture. A knock or ping caused by the ethanol will be picked up by the knock sensor and the computer will respond by enriching the fuel mixture and reducing the timing advance therefore causing much greater fuel consumption. My Nissan truck dropped from 21 mpg to 14 mpg (33%) with the great green ethanol mandate. My jeep only dropped about 4 mpg (15 – 20%). The point is that there is a much greater effect in a vehicle’s performance that just the lesser amount of power / energy produced by the ethanol itself. The other factors are much greater. Ethanol is a big failure by any measure. Thank you for the link. It reads that all of the power produced will remain on the site. Obviously it will supplement the facilities power needs. Was it subsidized by the taxpayers in one form or another? While it is a very large installation at 10 acres, it utilizes the existing roof and is a very good use of space as well as likely reducing the solar heat load on the building’s roof that could be a plus in the summer day. That point could be a wash as it would be a negative in the winter day. The actual dollars invested, how long for payback or break even? The large scale operations that I was refering to would be building expensive arrays to feed the grid. That, in my opinion, is a joke. Burning natural gas might emit less CO2e per kilowatt than coal or oil (though leaks from pipes are another issue muddying the waters on that deceptively simple looking claim), but the fact remains that doing so is still taking carbon from its excellent long-term underground sequestration and putting it into the active carbon cycle above ground. It may be cutting our throats slightly more slowly, but it is still cutting our throats. The trick is to leave enough fossil fuels under the ground. Any response that does not take seriously that requirement is either shortsighted, propaganda for more profit, or an avoidance of responsibility (a.k.a. kicking the can down the road). You got it right when you posted the same comment text at Junk Science when this post was mentioned, how did you goof it up here? Thus saying “how much electricity is used” is erroneous, with the title of that page somewhat disingenuous, as it is “energy used”, not “electricity used”. From fueleconomy.gov, the 2012 Chevy Volt uses 36 kWh per 100 miles, combined driving (city and highway). That 6 kWh would be enough to travel almost 17 miles. It also gets 37 mpg combined (premium gas). So, 6/36 * 100mi / 37mpg = 0.45 gal. Sure sounds like a lot of waste when looked at that way. Although as noticed where the “impressive” Miles per Gallon Equivalent figure is presented, “1 gallon of gasoline=33.7 kw-hr”. 6/33.7 = 0.178 gallon of gasoline. So in reality, the energy to refine 1 gal of gasoline is equivalent to only 0.178 gal of gasoline. The Volt takes 0.45 gal to yield the energy stored in 0.178 gal, so 0.178/0.45=0.40, thus 40% efficiency gasoline to electricity. That 0.178 gal would yield only 6.6 miles. Your average EV can go 16 miles on 4kwh (20 miles on 7.5kwh)- so that’s on the electricity used to just to refine that gallon of gas, nevermind the energy used to extract and transport the oil, and the tailpipe emission. There’s a correction in the comments, should be 30 miles for 7.5 kWh. But at 36kWh/100mi, the 2012 Volt could only get 11 miles for 4 kWh. Thus the Volt, the height of GM engineering excellence in electric powertrain vehicles, is only getting 69% what an average EV can get according to that quote. Also, as reported in this Edmund’s article, the 2011 Nissan Leaf, an all-electric plug-in vehicle, uses 34kWh/100mi, thus gets only 74% of what an average EV can get. Thus that quote on that page appears questionable in its accuracy. And that’s also questionable. The 2011 Nissan Leaf would get only 18 miles, and that’s rounded up. 6kWh/(0.36kWh/mi)*100mi / 25 mi = 0.71, 71% of the “no link” Nissan figure. Possibly because it just ain’t true? Even at 7.5 kWh per gallon of refined gas, the 2011 Leaf could only go 21 miles. The 2012 Volt gets 40% fuel-to-electricity efficiency (see above). From the US Energy Information Administration, using the method here to calculate power plant efficiency from the numbers here, the average efficiency of a coal-fired electricity-generating plant in 2009 was 32.8%. The EIA also says that electricity transmission and distribution losses average about 7%, thus t&d is about 93% efficient. So, 0.328*0.93=0.31, from coal to electricity to the Chevy Volt’s charger there is about 31% efficiency. Putting gasoline into the Volt is 40% efficient. No info on efficiency of the charger. So you get more energy from the starting fuel source by using gasoline in the tank rather than electricity from the charger, about a third more. If you’re really worried about “carbon emissions” and real pollution, don’t charge your Volt unless you know your electricity source is “Green” enough to make up the difference. Excellent summary. I have seen several instances that I would have liked to repost a portion or all.